JUNEAU — Gov. Mike Dunleavy’s choice to lead the Alaska Department of Administration has resigned from his job a day after one of his former employers told state legislators he lied on his resume. Jonathan Quick’s resignation came shortly after 8 p.m. Thursday. “Earlier this evening, Commissioner Designee Jonathan Quick resigned. I appreciate his willingness to serve the people of Alaska and wish him the best in his future endeavors,” Dunleavy said in remarks released with the resignation announcement. Quick will be replaced on an interim basis by Paula Vrana, an attorney who joined the department Jan. 2. 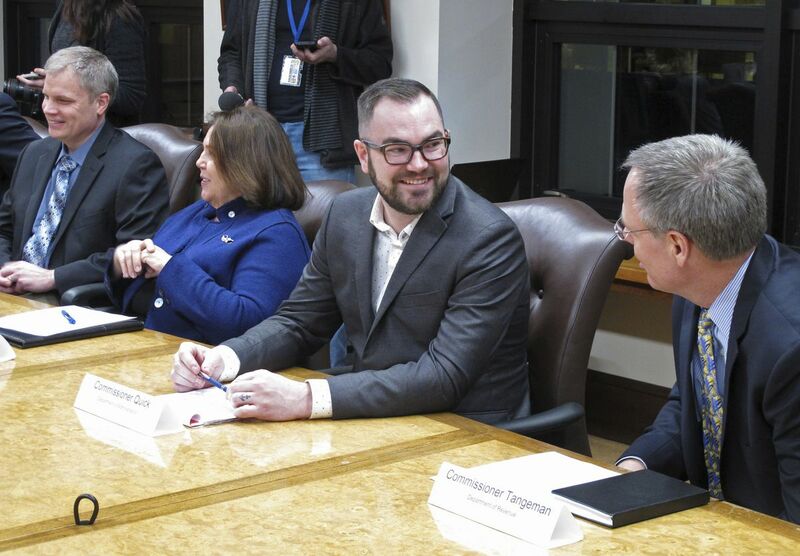 Also Thursday evening, Dunleavy press secretary Matt Shuckerow said former state labor relations director Art Chance will no longer be joining the administration. Chance, who has a history of vulgar, vitriolic and misogynistic posts on social media, had been slated to join the Department of Administration as a policy adviser. “This decision is for the best," the governor said in a prepared statement. Quick, who had been selected as commissioner of administration in late November, saw his path to legislative confirmation derailed when Janie Reynolds, co-owner of two small businesses in Washington state, said Quick exaggerated his experience with those businesses and gave incorrect information to lawmakers during a confirmation hearing Tuesday morning. The letter was first published by political blog The Alaska Landmine and independently verified by the Daily News. “I find it almost offensive that someone would present themselves as a small-business person when I guess it’s less than the truth,” said Sen. Donny Olson, D-Golovin, in a Thursday afternoon news conference that took place after the letter was circulated but before Quick’s resignation. Until Thursday evening, it appeared Quick was determined to remain in office. In a message to lawmakers Thursday afternoon, Quick disputed aspects of the Reynolds letter and apologized for "incorrect information” during his confirmation hearing. “I’m 100 percent confident in the governor’s agenda, and we’re going to accomplish what we want to accomplish,” Quick told the Daily News in an interview from his office. Shuckerow, in a message Thursday afternoon, said Dunleavy supported Quick. Hours later, Quick offered his resignation, which was accepted. The Kenai job is the only government experience listed on his resume. Before becoming chief of staff, Quick’s resume states he worked as a “multi-line business owner and investor” between 2010 and 2017. Among his employers during this period was L&J Reynolds LLC, which operates Anthem Coffee & Tea and Elements Frozen Yogurt in Washington state. According to corporate filings, the L and J stand for Larry and Janie Reynolds, who are listed as the company’s owners. Quick’s resume states that he “helped recruit and secure investors and capital sources” for the companies, but Janie Reynolds disagrees. Reynolds said there were other inconsistencies between her knowledge and Quick’s resume, including the extent to which he formulated business and marketing plans for the businesses. Those were already in place before he was hired in 2011, she wrote. Quick was fired after about a year, she said. In Quick’s response to lawmakers after Reynolds' letter, he said he verbally entered into an agreement with Bryan Reynolds, the son of Larry and Janie Reynolds. “As the businesses grew, it became clear that the verbal agreement I entered into was not going to materialize into a written agreement. After numerous negotiations with the Reynolds family and much heartache for me and my family, we parted ways,” Quick wrote. In a confirmation hearing Tuesday morning, Sen. Bill Wielechowski, D-Anchorage, asked Quick when he sold his stake in the coffee, tea and yogurt businesses and who his co-investors were. Quick incorrectly said in 2014, and a “private party,” a friend from high school. Washington state business records list Quick as a past officer of We Are Guild LLC and Seattle Research Labs LLC. On his resume, Quick listed a co-working company called The Guild and a nutrition-supplement-selling company called Island Vibrance. Seattle Research Labs is the parent company of Island Vibrance. The same business records do not list any connection to Anthem, Elements or L&J. In his subsequent message to lawmakers, Quick apologized. “I accepted the terminology used by Senator Wielechowski when I should have clarified that I parted ways with the company, rather than selling an ownership stake,” he wrote. He also clarified that his relationship with the companies ended in 2012, not 2014. Wielechowski told the Daily News he “became aware of (the inconsistency) just in the last couple days.” Olson said he learned of it on Tuesday, after Quick’s hearing. Quick wasn’t the only Department of Administration official drawing attention. Some of Art Chance’s more caustic social media posts were shared on The Alaska Landmine earlier this week in a post questioning the administration’s selection of Chance as policy adviser. The Alaska Senate minority leader said Chance’s comments make him unqualified for state service, particularly as a high-level policy adviser. “You must insist on the highest-quality people in these jobs,” said Sen. Tom Begich, D-Anchorage. “These are really unacceptable in a state employee at any level, but especially at the highest levels."